You’ll never see another pair of mics like this. These are a matched pair that were hand-built in the RCA Camden, NJ plant in the mid-1960s. They were experimental laboratory mics built for the purpose of improving the 44BX design with higher output and improved response. Output sensitivity is about 2db higher than the 44BX and they are flat from 20hz-20khz, +/- 1/10db. This was accomplished by using special experimental materials for the magnets and pole piece structure. PB90 bodies and screens were used for these prototypes. The yoke mounts were modified from the 44BX. Unfortunately, RCA had recently introduced the BK11 to replace the 44BX, so they were never produced. This is the only pair in existence and the sound is absolutely awesome. 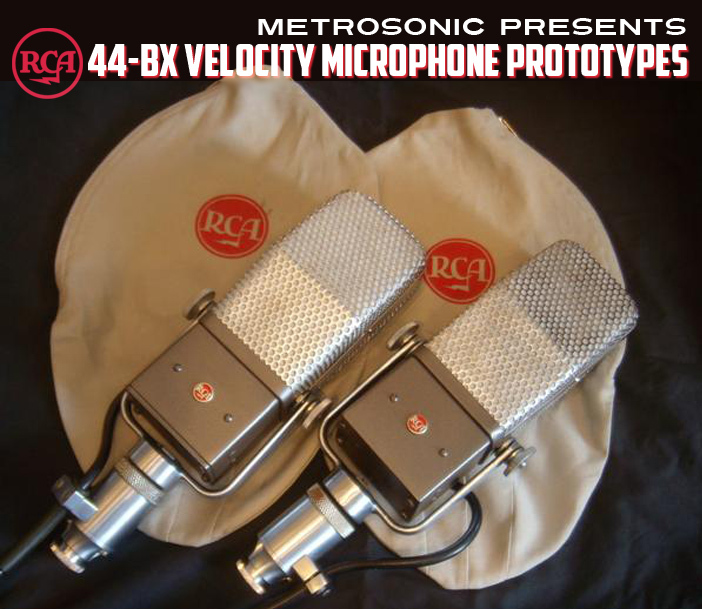 The RCA 44-BXs have a very smooth sound which is characteristic of a ribbon microphone. 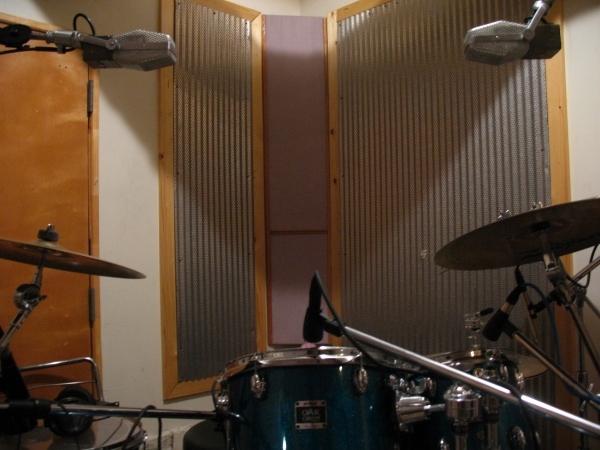 From the outset, the 44-BX was used for music and dialog recording. The bi-directional pattern was useful for recording ensembles using both sides of the microphone for balance while preserving visual contact between musicians. The 44-BX soon became a standard for voice reproduction in the broadcast industry. With its generous proximity response (effective within two meters), it gave most voices a warm and appealing presence without accentuating sibilance. One of the most useful properties of a velocity microphone is its bi-directional or figure-eight directional characteristics. As shown in the directional patterns (figures 2 and 3 above), the output of the micro phone is maximum for sounds originating directly in front of or behind the micro phone, and minimum for sounds originating at the sides, top or bottom. This characteristic is valuable for both vocal and musical pickup. For vocal pickup, its chief value lies in the fact that it enables participants in dialog to face each other across the micro phone. 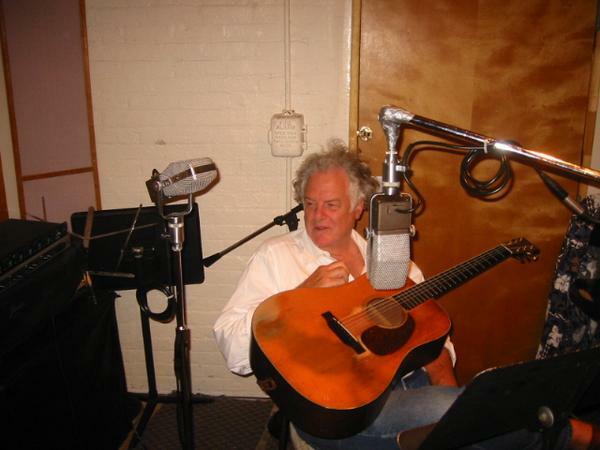 For musical pickup, it makes it possible to obtain different effects by arranging orchestral instruments about the micro phone so that the sounds of some instruments are attenuated and others are accentuated. 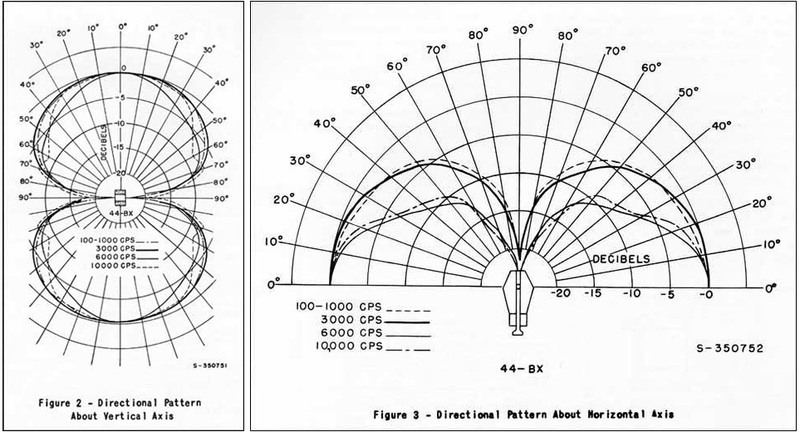 Diagrams from Radio Corporation of America Industrial Electronic Products Broadcast Audio Equipment Instructions for the 44-BX Velocity Microphone, MI-4027-H, -J, -K (with insert for -L), IB-24267-5(-5A), circa 1951. 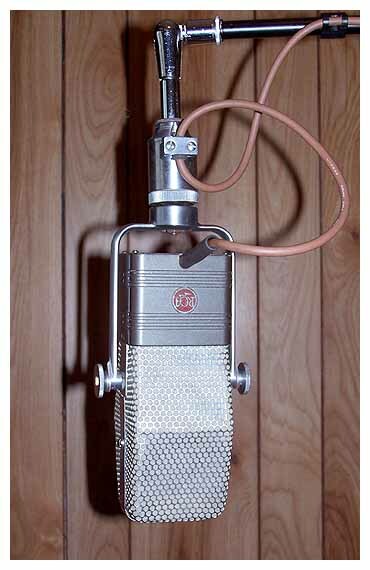 Considered by many as the most natural-sounding microphone ever made, ribbon mics were immediately embraced by the broadcast and recording industries. 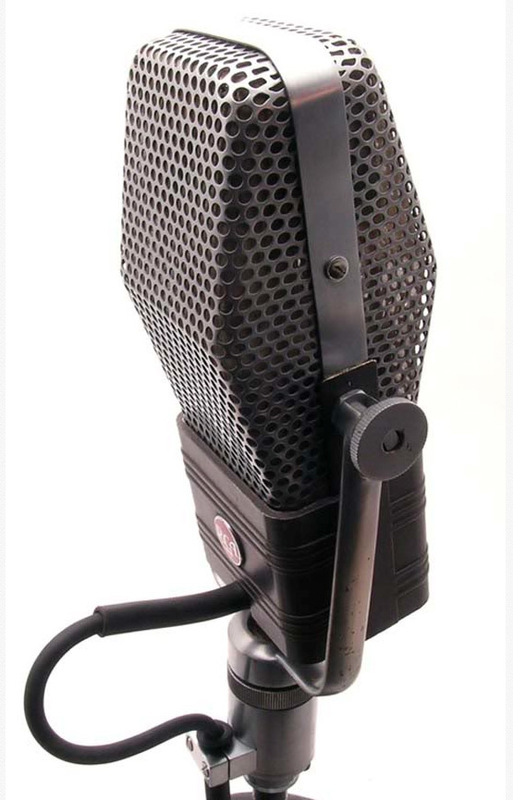 Not requiring any awkward power supply or batteries in their operation, the first commercially produced ribbon microphones appeared in the early 1930s. 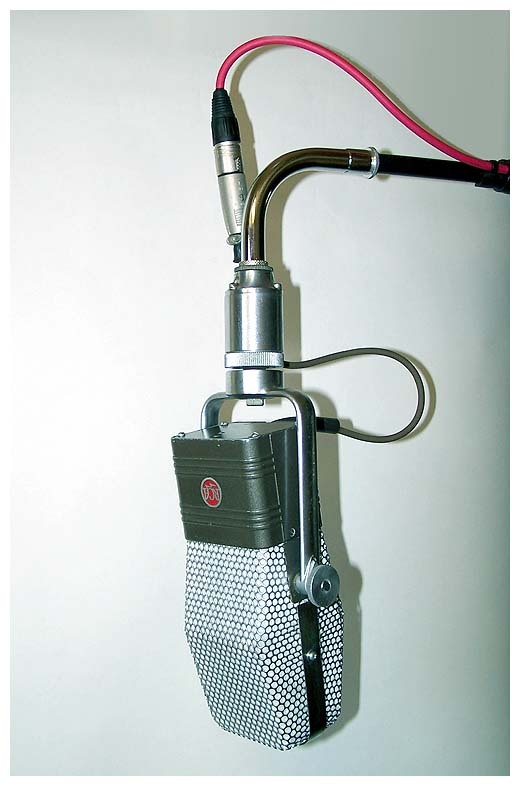 The ribbon microphone was also known as the velocity microphone and was the last of the four basic microphone types developed, following the dynamic, condenser, and carbon microphones. 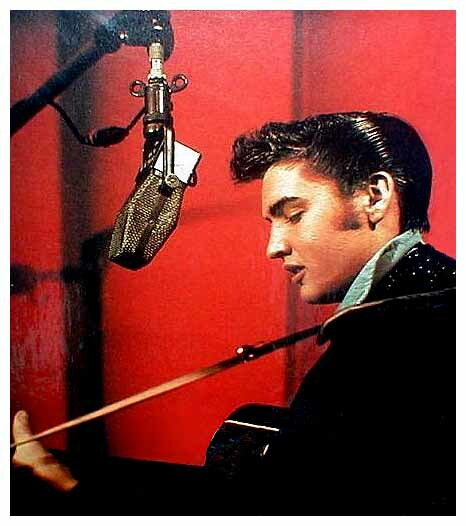 The ribbon’s natural sound can also be made to sound warm, big, and syrupy (Bing Crosby-like) when placed within two or three feet of the talent (generally, you can’t close-talk a ribbon without having a greatly exaggerated bass characteristic). An adequate breath filter in front of the ribbon is also necessary to protect the delicate ribbon (NEVER blow into a ribbon mic). The output level of the ribbon is nearly always lower than that of a dynamic microphone. For this reason, hum rejection and shielding are important considerations in ribbon microphone construction. The active element is of course the ribbon, consisting of a very thin corrugated aluminum ribbon clamped under light tension and mounted between the poles of a strong magnet. The extremely low impedance of the ribbon (typically on the order of 0.2 ohm) is fed directly into a step-up transformer to match low-impedance lines (50, 250, or 600 ohms). Although other companies at the time were producing ribbon microphones, RCA was top dog for several reasons. First, RCA had the sales channels in place, with a pipeline into the broadcast market. They also had huge advertising budgets. But perhaps a more compelling reason was that the research and development effort that went into these microphone produced a quality that was unmatched by the competition. 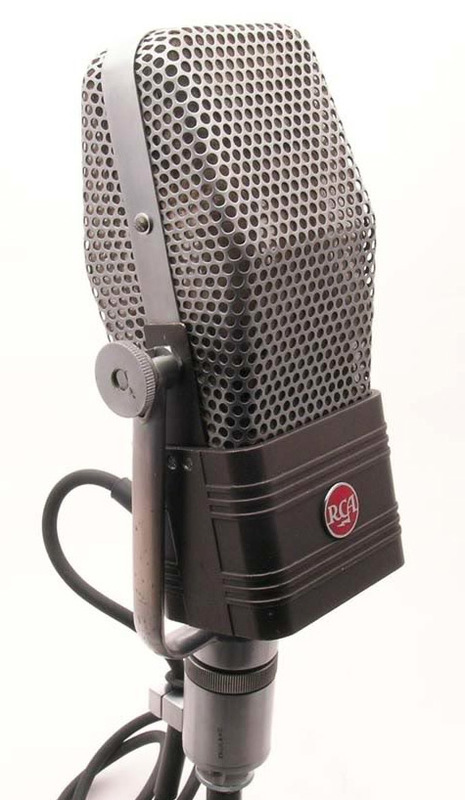 At the time, Western Electric was the only other manufacturer that could successfully compete with RCA; however, their only ribbon microphone was being targeted into the motion picture industry. 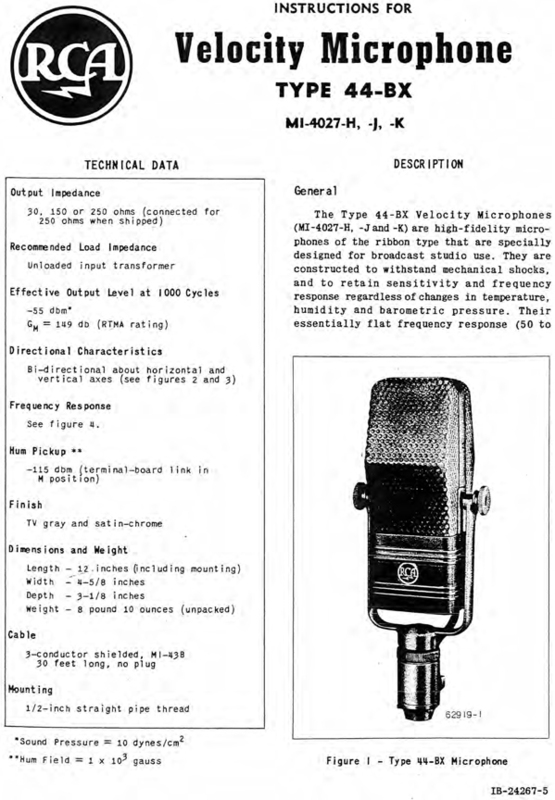 The original specifications for the non-custom RCA44-BX mic.